July 2015 sets a horrifying new high: The hottest month ever recorded. 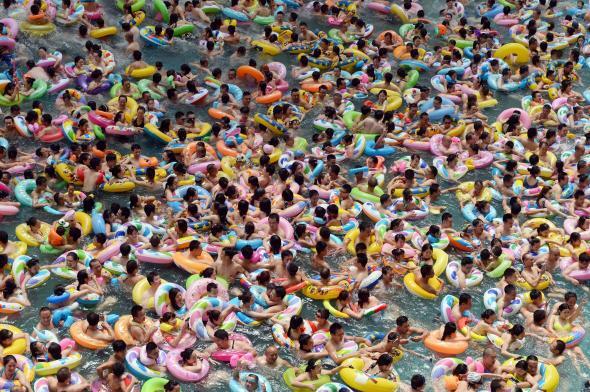 Visitors crowd at the “Sea of Death” tourist resort in Daying County, China to escape the high temperatures on July 11, 2015. Amid hot weather in July, more than eight thousand visitors from every corner of China crowded to “Sea of Death” to enjoy the cool. When trying to rank climate change mileposts, this is a big one. Earlier this week, data from NASA and the Japan Meteorological Agency showed July was the hottest July on record, globally. Thanks to a particularly strong El Niño, these sorts of monthly records have been coming fast and furiously lately, so that news like this almost seemed like nbd. But then, on Thursday, the National Oceanic and Atmospheric Administration confirmed that not only was last month the hottest July on record globally, it was also the hottest month on record overall. Since NOAA started keeping track in 1880, there has never been a hotter month. That’s a very big deal. The world was a swath of red in July 2015, the hottest month we have ever measured. The month was hot from start to finish. July 1st was the hottest day in the U.K.’s history—the Guardian briefly had to pause its liveblog of the heatwave because its computer servers overheated. On July 31st, the city of Bandar-e Mahshahr, Iran reached an unfathomable heat index of 165°F, nearly a world record. All this warmth on land is being driven by record-setting heat across large sections of the world’s oceans. The NOAA report notes that the warmest 10 months of ocean temperatures on record have occurred in the last 16 months. This is mostly due to a near-record strength El Niño, but the current state of the global oceans has little historical precedent. Since it takes several months for the oceanic warmth of an El Niño to fully reach the atmosphere, 2016 will likely be warmer—perhaps much warmer—than 2015. And that poses grave implications for the world’s ecosystems as well as humans. We’ve recently entered a new point in the Earth’s climate history. According to reconstructions using tree rings, corals, and ice cores, global temperatures are currently approaching—if not already past—the maximum temperatures commonly observed over the past 11,000 years (i.e., the time period in which humans developed agriculture), and flirting with levels not seen in more than 100,000 years. But this is the scary part: The current level of carbon dioxide in the atmosphere is higher than at any point since humans first evolved millions of years ago. Since carbon dioxide emissions lead to warming, the fact that emissions are increasing means there’s much more warming yet to come. What’s more, carbon dioxide levels are increasing really quickly. The rate of change is faster than at any point in Earth’s entire 4.5 billion year history, likely 10 times faster than during Earth’s worst mass extinction—the “Great Dying”—in which more than 90 percent of ocean species perished. Our planet has simply never undergone the kind of stress we’re currently putting on it. That stunning rate of change is one reason why surprising studies like the recent worse-than-the-worst-case-scenario study on sea level rise don’t seem so far fetched. World leaders don’t seem to be grasping this urgency. For all the discussion about climate change over the last few decades, the laws currently on the books will only limit warming a fraction of a degree less than business as usual. It’s enough to push climate scientists into a state of existential dread. They know what’s happening, but have very limited power to motivate significant change in a system that seems hellbent to destroy itself. It all sounds like the opening scenes to an epic disaster movie, I know. We’re just past the point where Dennis Quaid confronts a meeting of stubborn world leaders, yelling “look at this graph!” and not yet to the point when Matthew McConaughey is lured from retirement to go find us another habitable planet. What’s clear is that climate change is no longer just an issue for scientists or environmentalists—it’s become the most important human rights issue of our time. It may soon rise to the top of the world agenda, but for now, I can’t help but wonder: Where is everyone?